Background Patients undergoing cardiac angiography may suffer from acute kidney injury (AKI) due to the effect of the contrast medium. Different biomarkers described the clinical condition and had led to concepts like subclinical AKI or renal angina (RA). 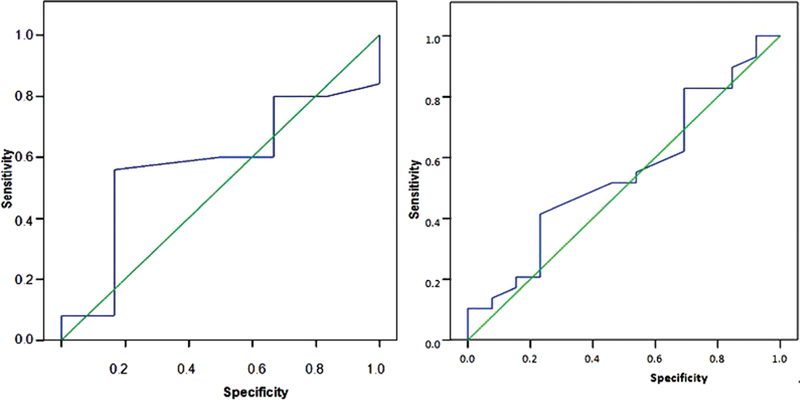 Objective Detection of the usefulness of the biomarker urinary liver-type fatty acid binding protein (L-FABP) which increases along with renal tubular hypoxia, in early prediction of RA in patients subjected to coronary angiography (CA). Patients and methods Forty patients (54.10±9.13 years, 34 males) routinely scheduled for CA were included. The risk for AKI was evaluated, and the renal function was assessed using RIFLE (risk, injury, failure, loss, and end stage kidney) criteria. L-FABP was detected on admission and 4 h after CA. The intrarenal duplex was performed on admission and after CA, and resistivity index (RI) and pulsatility index were estimated. Results Compared to serum creatinine before CA, its values increased significantly but within the normal range 4 h after CA (0.86±0.23 vs 1.08±0.52 mg/dl, P<0.05), and compared to the estimated creatinine clearance rate before CA, its values reduced significantly but within the normal range 4 h after CA (110.33±34.19 vs 92.98±25.41 ml/min, P<0.001). Compared to L-FABP before CA, it values increased significantly 4 h after CA (5.19±1.95 vs 39.28±13.06 μg/ml, P<0.001), and compared to RI before CA, the index increased significantly 4 h after CA (0.62±0.1 vs 0.67±0.12, P<0.001). L-FABP could predict RA, with area under the curve at 0.55 (sensitivity 41%, specificity 76%) and cutoff value at 39.1 μg/ml. RI could also predict RA, with area under the curve at 0.65 (sensitivity 69%, specificity 48%) and cutoff value at 0.56. Conclusion This study highlighted the importance of L-FABP and RI in early prediction of RA 4 h after contrast media injection and earlier than either serum creatinine or its clearance rate. Although L-FABP is more specific, but RI showed more sensitivity to RA. Identifying individuals at higher risk for developing acute kidney injury (AKI) in the ICU is of increasing interest. Approximately 50% of ICU patients have AKI as defined by the sensitive RIFLE (risk, injury, failure, loss, and end stage kidney)-criteria definition, and up to 5–15% of these patients are treated with renal replacement therapy . The renal tubular damage without glomerular function loss was demonstrated to be associated with worse renal and overall outcomes . The term subclinical AKI has been used to challenge the traditional picture that the renal function starts to be clinically apparent only when a loss of filtration function becomes evident. A new domain of AKI diagnosis could then include functional criteria and besides the damage criteria. This may influence the epidemiology, prevention, and management of AKI . This lead to the proposed subclinical term of ‘renal angina’ (RA), which represents a combination of patient risk factors and subtle changes in serum creatinine (SC) and urine output as a methodology to predict evolving AKI . In a patient with different AKI risk factors, we need a smaller change in SC and urine output to raise a clinical suspicion for evolving AKI, thus rendering SC to be a late marker of AKI. However, in another patient with fewer risk factors, it would show a bigger change in SC to reach that level of suspicion. AKI can be diagnosed earlier by different renal biomarker ,, these biomarkers have led to concepts like RA . Although contrast medium (CM) is irreplaceable for coronary angiography (CA), CM may induce renal hypoperfusion and hypoxia through direct endothelial damage , due to the direct effect of CM on the cellular toxicity besides the viscosity . Contrast-induced acute kidney injury (CIAKI) is commonly defined as a rise in blood urea nitrogen, SC, or a decline in the estimated creatinine clearance rate (eCCr) occurring in a narrow time window; typically 24–72 h after administration of iodinated CM . An absolute increase in SC by more than or equal to 0.5 mg/dl from baseline is a simple and still widely used definition of AKI complicating such condition . Patients who suffer from systemic endothelium disorder with subsequent circulation injuries, such as diabetes mellitus, advanced age, hypertension, and hyperlipidemia, in addition to pre-existing renal damage, all are at higher risk for development of CIAKI . Liver-type fatty acid binding protein (L-FABP) expresses in the proximal tubular epithelial cells. This endogenous antioxidant promotes free fatty acid metabolism by binding long-chain fatty acid oxidation products . L-FABP gene is responsive to hypoxic stress, which occurs in the setting of kidney ischemic reperfusion injury. As a consequence, urinary excretion of L-FABP reflects the stress in the proximal tubular epithelial cells, correlating with the severity of the ischemic tubular damage. The performance of urinary L-FABP as an early detection marker of RA has shown a promise in various clinical settings . Several studies showed an increase in urinary L-FABP levels due to the administration of CM in patients undergoing CA . Some investigators found that, the increase in L-FABP after administration of CM was not observed in the patients without onset of CIAKI , another group found that an increase in L-FABP at 48 h after administration of CM was significantly associated with decrease in renal function 1 year later in the patients undergoing CA without occurrence of CIAKI . On the other hand; over the past 2 decades, Doppler waveform of intrarenal arterial blood flow have been extensively investigated to determine physiologic and pathologic correlations. Among the parameters introduced, the renal resistive index (RI), which is considered a reflection of renal parenchymal resistance, has been widely used to support diagnostic and therapeutic procedures . Determination of RI by Doppler sonography has also been suggested as a means of diagnosing acute tubular necrosis . This study was not designed to assess CIAKI which typically occurs 24–72 h after intravenous administration of CM, but was intended to evaluate the urinary L-FABP as a renal biomarker in early detection of the subclinical functional form of AKI; the RA syndrome 4 h after intravenous administration of CM, in comparison with the renal RI obtained by intrarenal arterial duplex. This prospective cohort study included 40 patients admitted to the Critical Care Medicine Department, Cairo University Hospitals for scheduled CA. This study has been endorsed by the Ethical Committee Review Board of the Faculty of Medicine, Cairo University. Consents were acquired from each patient before the enrollment in the study. The exclusion criteria included: AKI defined by RIFLE criteria, prior kidney transplantation, renal replacement therapy prior to ICU admission, all types of shocks, acute coronary syndrome, infection, need for emergency CA, or intravascular administration of CM within the previous 6 days . On admission, all patients were subjected to full clinical evaluation including demographic data, medical history of chronic illness, and prior drug history. Laboratory investigations included complete blood count, liver function tests, and serum electrolytes. ECG and echocardiography and abdominal ultrasonography were also done on admission. The risk factors for AKI were evaluated, including diabetes mellitus, hypertension, dyslipidemia, smoking, the amount of CM which was injected into the patient during CA, and severity of coronary artery disease in CA. Proper intravenous hydration with normal saline (80 ml/h) was administrated 5 h before CM injection. The contrast media used in this study was nonionic, low-osmolality iodinated CM and the dose was recorded. Renal function was evaluated including measurement of baseline SC on admission and 4 h after CA. 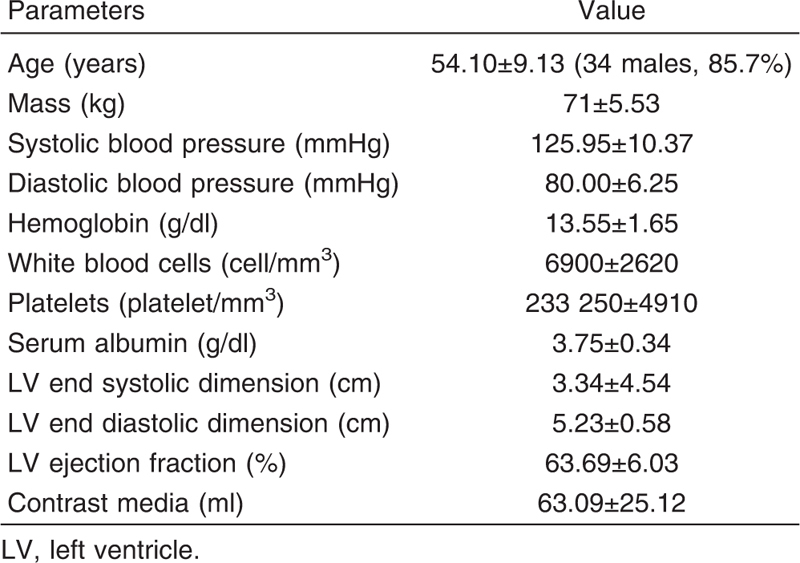 AKI was assessed according to the RIFLE criteria ([Table 1]) . Estimated eCCr was calculated according to Cockcroft–Gault formula . Urine samples were collected from each patient on admission and 4 h after CA. L-FABP (μg/ml) analysis was performed by the enzyme-linked immunosorbent assay method (CMIC Co. Ltd, Shinagawa-ku, Tokyo, Japan) in the biochemistry laboratory of the Critical Care Medicine Department, Cairo University Hospitals. The measurement was performed directly on the urine samples. The early detection of a subclinical functional form of AKI ‘the RA syndrome’ within 4 h after intravenous administration of CM was first evaluated by the early and the small deterioration of both SC and the eCCr. Proper hydration with normal saline at 80 ml/h was continued after the procedure of CA to reduce the incidence of CIAKI. Statistical package of SPSS version 12.0 was used for our analysis (SPSS Inc., Chicago, Illinois, USA). Data was summarized using mean±SD values. Comparisons between groups were made using nonparametrical Kruskal–Wallis test and Mann–Whitney test. For comparing serial measurements, the nonparametrical Friedman’s test and Wilcoxon’s test were used. For analyzing categorical data, χ2-test was performed. We used analysis of variance (ANOVA) test for analyzing the differences among multiple mean from matched samples. Correlations between variables were done using Pearson’s or Spearman’s correlation coefficient when applicable. The receiver operator characteristic (ROC) curves were derived, and area under the curve (AUC) analysis was performed to get the best cutoff values of both L-FABP and RI for prediction of RA with reduced eCCr. P values less than 0.05 were considered as statistically significant. 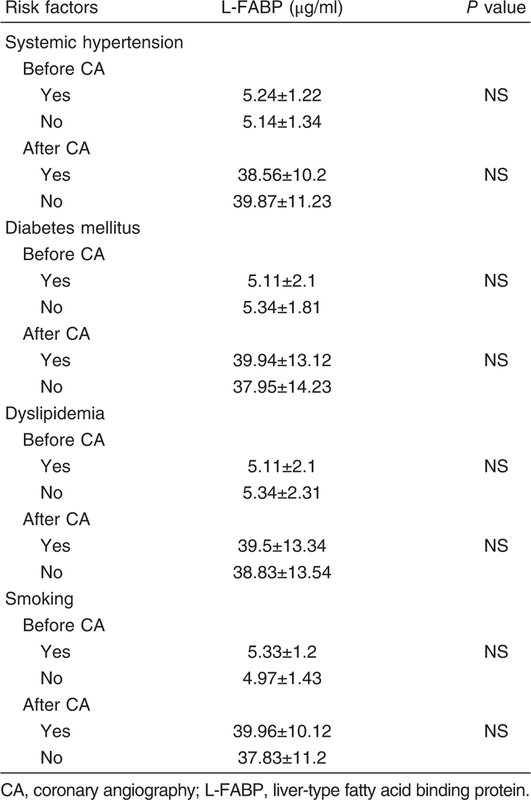 A total of 40 patients scheduled for CA were included in this study. [Table 2] shows the demographic and the clinical data of the patients. We detected the risk of the patients as follows: 23 (54.8%) patients with systemic hypertension, 14 (33.3%) patients with diabetes mellitus, 14 (33.3%) patients with dyslipidemia, and 17 (40.5%) smoker patients. Our study showed that, compared to SC before CA, the values increased significantly but within the normal range 4 h after CA (0.86±0.23 vs 1.08 ±0.52 mg/dl, P<0.05). Compared to the eCCr before CA, the rate reduced significantly but within the normal range 4 h after CA (110.33±34.19 vs 92.98±25.41 ml/min, P<0.001). Using RIFLE criteria, none of our patients showed AKI until 4 h after administration of CM. For L-FABP values, compared to the values before CA, L-FABP increased significantly 4 h after CA (5.19±1.95 vs 39.28±13.06 μg/ml, P<0.001). For the intrarenal arterial duplex indices; compared to RI before CA, the index increased significantly 4 h after CA (0.62±0.1 vs 0.67±0.12, P<0.001), but the results were comparable with PI values before and 4 h after CA (0.90±0.16 vs 0.93±0.17, P=nonsignificant) ([Figure 1]). Figure 1 Example of estimated RI of the right kidney in one of our patient before (left) and 4 hours after (right) coronary angiography. Our results showed that the decreased percentage of SC and the decreased percentage of eCCr on admission and 4 h after CA was 17.48 and 15.54%, respectively. The increased percentage of L-FABP on admission and 4 h after CA was 85.89%. For the intrarenal arterial duplex indices, our results showed that the increased percentage of both RI and PI before and 4 h after CA was 6.39 and 2.34%, respectively. The clinical data of our study detected different renal risk factors. But our results showed comparable L-FABP values before and 4 h after CA whatever the presence of the risk factors which included systemic hypertension, diabetes mellitus, dyslipidemia, or smoking, reflecting the independence of L-FABP as a predictive biomarker for RA ([Table 3]). 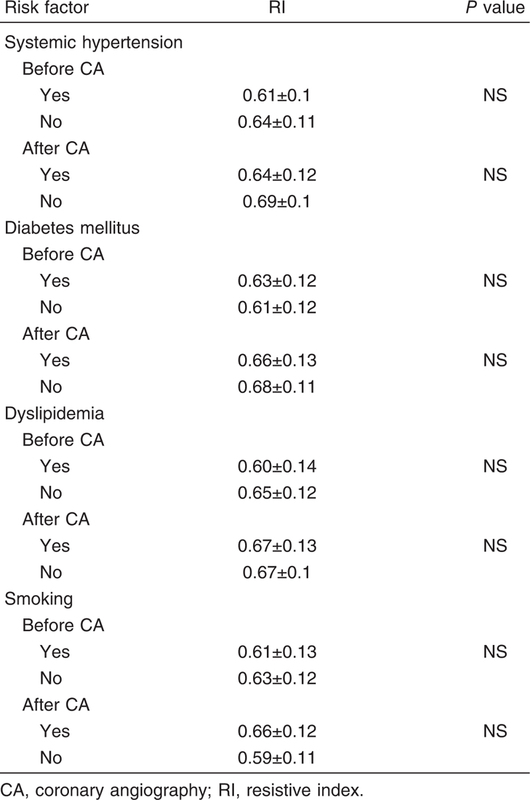 Similar results could be detected on comparing RI values before and 4 h after CA whatever the presence of the risk factors ([Table 4]). Our results showed that an average correlation could be detected between L-FABP and SC, with an average inverse correlation with eCCr ([Figure 2]). An average correlation could be detected between RI and SC, with an average inverse correlation with eCCr (r=0.03, P<0.05 and r=−0.3, P<0.05, respectively). Also, an average correlation could be detected between PI and SC, with an average inverse correlation with eCCr (r=0.27, P<0.05 and r=−0.33, P<0.05, respectively). Figure 2 Correlation between L-FABP and serum creatinine (left), and estimated creatinine clearance rate (right). An average correlation could be detected between L-FABP and both RI and PI (r=0.36, P<0.05 and r=0.38, P<0.5, respectively). On using ANOVA test for different variances among multiple matched samples, our results showed a statistically insignificant matching could be detected between L-FABP values before and 4 h after CA whatever the number of the coronary artery vessel disease ([Table 5]). 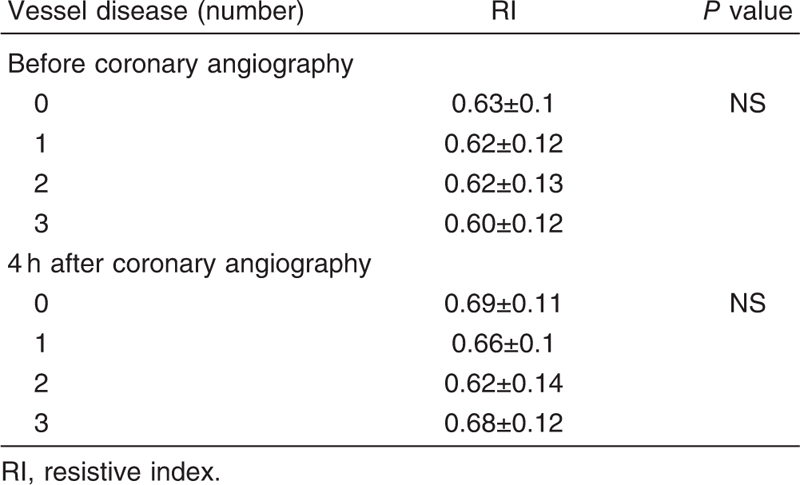 Similar findings could be detected, on using ANOVA test for different variances among multiple matched samples, that showed a statistically insignificant matching could be detected between intrarenal arterial RI before and 4 h after CA whatever the number of the coronary artery vessel disease ([Table 6]). Our results showed that poor correlation could be detected between the injected dose of CM and either SC (r=0.19), eCCr (r=−0.12), L-FABP (r=0.16), RI (r=0.25), or PI (r=0.15). ROC curve was calculated for L-FABP values to predict the decrease in eCCr and subsequently RA 4 h after CA. The AUC was 0.55 with L-FABP cutoff value at 39.1 ng/ml (sensitivity 41%, specificity 76%) ([Figure 3]). Figure 3 ROC curve study of L-FABP (left) and RI (right) to predict eCCr and renal angina 4 hours after coronary angiography. Also, the ROC curve was calculated for RI values to predict the decrease in eCCr and subsequently RA 4 h after CA. The AUC was 0.56% with RI cutoff value at 0.65 (sensitivity 69%, specificity 48%) ([Figure 3]). In this study, our aim was not the detection of the contrast-induced AKI which typically occurs 24–72 h after intravenous administration of CM, but the detection of the early subclinical and functional form of AKI; the RA syndrome, which could be detected up to 4 h after intravenous administration of CM in our study. For this purpose, we evaluated the urinary L-FABP as a promising renal biomarker in comparison with ‘up to our knowledge for the first time’ the RI obtained by the intrarenal arterial duplex to detect RA after injection of CM. Our study showed that, compared to SC before CA, the values significantly increased but within the normal range 4 h after CA (P<0.05) with 17.5% decreased percentage. For L-FABP, compared to the values before CA, the values significantly increased 4 h after CA (P<0.001) with 89% increased percentage. In the line of our research, Portilla et al. evaluated both SC and urinary L-FABP in 40 patients before and after cardiopulmonary bypass surgery. They detected AKI in 21 patients with increased urinary L-FABP at 4 h postsurgery, whereas rising in SC above the average values were not seen until 24–72 h postsurgery. Metzger et al. also showed that the identified L-FABP biomarker pattern enabled accurate detection of AKI in patients at least 5 days before the rise of SC, providing a substantial time frame to initiate established therapeutic interventions to prevent AKI or its progression and potentially improving the clinical outcome. Doi et al. demonstrated that urinary L-FABP had a better diagnostic ability for the detection and prediction of AKI than other biomarkers. They observed that L-FABP were significantly associated with 14 days in-hospital mortality. In our study, compared to the eCCr before CA, the rate reduced significantly but within the normal range 4 h after CA (P<0.001) with 15.54% decreased percentage. Fujita et al. , studied the urinary L-FABP before coronary artery bypass graft at 24 and 48 h in 12 patients. Measurement of L-FABP at 48 h after the bypass surgery showed better and significant correlation with the change in eCCr (P<0.05). Measurement of L-FABP at 48 h after the surgery was useful in detecting renal damage, and in predicting 1-year renal outcome . We found a significant rise of L-FABP level (P<0.001) 4 h after injection of CM during CA in the detection RA. Our results also matched with Lotfy et al. , who concluded that L-FABP could be considered as a predictive biomarker of contrast-induced nephropathy before and after contrast exposure instead of SC. Vijayasimha et al. studied 100 patients with average SC undergoing the angiographic procedure. L-FABP was assessed at baseline, 2, 4, 12, 24, and 48 h after the angiographic procedure. They showed a significant maximum rise in L-FABP 12 h after the angiographic procedure with the presence of contrast-induced nephropathy associated in 9% of their patients. This disagreement with our study is explained by; our aim was designed for the detection of RA at 4 h post-CM injection and not the detection of CM-induced AKI at least 12 h post-CM injection. Our results were also in agreement with, Nakamura et al. , who studied 66 patients undergoing nonemergency CA or intervention who had SC level between more than 1.2 mg/dl and less than 2.5 mg/dl. Before angiography, L-FABP levels were significantly higher in 13 patients who showed CM-induced nephropathy than in the remaining 53 patients with non-CM-induced nephropathy (P<0.05). Two days after angiography, L-FABP showed a statistically significant further increase, reflecting that it can serve clinically as a predictive biomarker for CM-induced nephropathy. This disagreement with our study is explained by; this study included patients with impaired kidney function and high SC. Despite we showed insignificant matching between L-FABP values before and 4 h after CA, and the presence of different the renal risk factors; including systemic hypertension, diabetes mellitus, dyslipidemia or smoking, or the number of the coronary artery disease vessels, but the ischemic heart disease was a dominantly associated condition in our study and was considered as an already existing risk factor for AKI. Fukuda et al. had the first report that measurement of urinary L-FABP can be beneficial in the diagnosis of acute coronary syndrome. Matsumori et al. also demonstrated the findings that urinary L-FABP levels 24 h after primary coronary intervention were associated with future cardiovascular events. Both previous studies showed that, patients with the acute coronary syndrome especially those with acute myocardial infarction had significantly higher L-FABP levels that may help to identify high-risk patients for future cardiovascular events after acute coronary syndrome. This disagreement with our study is explained by; we compared L-FABP to the coronary artery vessel disease 4 h after CM injection, but the other studies comparison was at least 24 h after CM injection. Our results showed that the intrarenal arterial duplex RI before and 4 h after CA, showed significantly increased value (P<0.001) with 6.39% increased percentage, but the results were comparable with PI values. We could not found published studies discussing the role of the intrarenal RI in early detection of contrast-induced AKI. This signifies the importance of our results and its validity in the early prediction of RA after CM exposure. Schnell et al. determined the predictive value of intrarenal duplex RI at 12 h and 3 days in the development of AKI in critically ill 58 patients with severe sepsis. They detected that intrarenal RI is a promising tool for detection and follow-up of AKI. Also, Marty et al. concluded that the postoperative intrarenal RI at 12 h appeared to be proper timing for early detection of AKI after major surgery in 50 patients older than 65 years with a risk of AKI. In our study, we evaluated L-FABP values in the prediction of the decrease in the eCCr 4 h after CA. We found that AUC was 0.55 with L-FABP best cutoff value at 39.1 ng/ml to predict RA (sensitivity 41%, specificity 76%). In the line of our results, Fukuda et al. evaluated the urinary L-FABP levels at 4 h after cardiac bypass surgery in 87 urine samples. L-FABP was an independent risk indicator with AUC at 0.81 (sensitivity 71%, specificity 68%) with a 24-fold increase in urinary L-FABP. Also, Metzger et al. identified a panel of different urinary proteins including L-FABP at various time schedule in the prediction of AKI in a heterogeneous ICU population with an AUC at 0.91. For the intrarenal RI values, we predicted the decrease in the eCCr 4 h after CA. The AUC was 0.56% with RI best cutoff value at 0.65 to predict RA (sensitivity 69%, specificity 48%). Marty et al. evaluated the intrarenal RI in 50 patients older than 65 years by ROC curves analysis with AUC to detect AKI at 0.86. The most accurate cutoff value for RI was at 0.71 postoperatively (sensitivity = 94%, specificity = 71%). The disagreement with our results came from the older group of their patients, besides their duplex images were not obtained at ICU admission, but 12 h postadmission. Besides our small sample size, we did not have the chance for more subsequent measurement of L-FABP after 4 h from CM injection, which would give us more understanding about the patient’s follow-up and outcome. But our aim was from the bingeing only the early 4 h after CM injection which reflects the risk of rising of the RA syndrome. Also, the limited number of similar publications for better comparison with our results added further to the limitation. This study highlighted the importance of the biomarker urinary L-FABP as an early predictor of RA which is considered as an early subclinical and functional form of AKI in patients undergoing CA with injection of contrast media. Also, we could detect the value of the noninvasive, feasible, and reproducible technique of intrarenal arterial duplex RI, as an early predictor of RA in such patients. Early detection of RA would reduce the progression of AKI and improve its outcome in critically ill patients subjected to injection of contrast media. Our results also showed that L-FABP is a more specific lab test in ruling in RA 4 h after CM injection with a high degree of confidence, than the intrarenal arterial RI which is more sensitive in ruling out the disease. Hoste EAJ, De Corte W. Epidemiology of AKI in the ICU. Acta Clin Belg 2007; 62(Suppl 2):314–317. Ronco C, Kellum JA, Haase M. Subclinical AKI is still AKI. Crit Care 2012; 16:313. Goldstein SL, Chawla LS. Renal angina. Clin J Am Soc Nephrol 2010; 5:943–949. Hoste EAJ, Schurgers M. Epidemiology of acute kidney injury: how big is the problem? Crit Care Med 2008; 36:S146–S151. Sendeski MM, Persson AB, Liu ZZ, Busch JF, Weikert S, Persson PB et al. Iodinated contrast media cause endothelial damage leading to vasoconstriction of human and rat vasa recta. Am J Physiol Renal Physiol 2012; 303:F1592–F1598. Seeliger E, Sendeski M, Rihal CS, Persson PB. Contrast-induced kidney injury: mechanisms, risk factors, and prevention. Eur Heart J 2012; 33:2007–2015. McDonald RJ, McDonald JS, Bida JP, Carter RE, Fleming CJ, Misra S et al. Intravenous contrast material-induced nephropathy: causal or coincident phenomenon? Radiology 2013; 267:106–118. Franke RP, Jung F. Pathophysiology of the contrast media-induced nephropathy (CIN) in patients undergoing coronary interventions. Clin Hemorheol Microcirc 2013; 53:143–153. Susantitaphong P, Siribamrungwong M, Doi K, Noiri E, Terrin N, Jaber BL. Performance of urinary liver-type fatty acid-binding protein in acute kidney injury: a meta-analysis. Am J Kidney Dis 2013; 61:430–439. Fukuda Y, Miura S, Zhang B, Iwata A, Kawamura A, Nishikawa H et al. Significance of urinary liver-fatty acid-binding protein in cardiac catheterization in patients with coronary artery disease. Intern Med 2009; 48:1731–1737. Nakamura T, Sugaya T, Node K, Ueda Y, Koide H. Urinary excretion of liver-type fatty acid-binding protein in contrast medium-induced nephropathy. Am J Kidney Dis 2006; 47:439–444. Fujita D, Takahashi M, Doi K, Abe M, Tazaki J, Kiyosue A et al. Response of urinary liver-type fatty acid-binding protein to contrast media administration has a potential to predict one-year renal outcome in patients with ischemic heart disease. Heart Vessels 2015; 30:296–303. Parolini C, Noce A, Staffolani E, Giarrizzo GF, Costanzi S, Splendiani G. Renal resistive index and long-term outcome in chronic nephropathies. Radiology 2009; 252:888–896. Darmon M, Schortgen F, Vargas F, Liazydi A, Schlemmer B, Brun-Buisson C et al. Diagnostic accuracy of Doppler renal resistive index for reversibility of acute kidney injury in critically ill patients. Intensive Care Med 2011; 37:68–76. Meinel FG, De Cecco CN, Schoepf UJ, Katzberg R. Contrast-induced acute kidney injury: definition, epidemiology, and outcome. Biomed Res Int 2014; 2014:859328. Lopes JA, Jorge S. The RIFLE and AKIN classifications for acute kidney injury: a critical and comprehensive review. Clin Kidney J 2013; 6:8–14. Gault MH, Longerich LL, Harnett JD, Wesolowski C. Predicting glomerular function from adjusted serum creatinine. Nephron 1992; 62:249–256. Viazzi F, Leoncini G, Derchi LE, Pontremoli R. Ultrasound Doppler renal resistive index: a useful tool for the management of the hypertensive patient. J Hypertens 2014; 32:149–153. Portilla D, Dent C, Sugaya T, Nagothu KK, Kundi I, Moore P et al. Liver fatty acid-binding protein as a biomarker of acute kidney injury after cardiac surgery. Kidney Int 2008; 73:465–472. Metzger J, Kirsch T, Schiffer E, Ulger P, Mentes E, Brand K et al. Urinary excretion of twenty peptides forms an early and accurate diagnostic pattern of acute kidney injury. Kidney Int 2010; 78:1252–1262. Doi K, Negishi K, Ishizu T, Katagiri D, Fujita T, Matsubara T et al. Evaluation of new acute kidney injury biomarkers in a mixed intensive care unit*. Crit Care Med 2011; 39:2464–2469. Lotfy EM, Ismail MI, Shindy AM, Mohamed LA. Urinary liver type fatty acid binding protein and plasma cystatin c as early predictors of contrast-induced acute kidney injury. ZUMJ 2013; 19:331–341. Vijayasimha M, Das Majumdar SK, Satyanarayana PV, Yadav A. Liver type fatty acid binding protein (L-FABP): a marker of contrast induced-acute kidney injury. Adv Life Sci Technol 2014; 19:22–26. Matsumori R, Shimada K, Kiyanagi T, Hiki M, Fukao K, Hirose K et al. 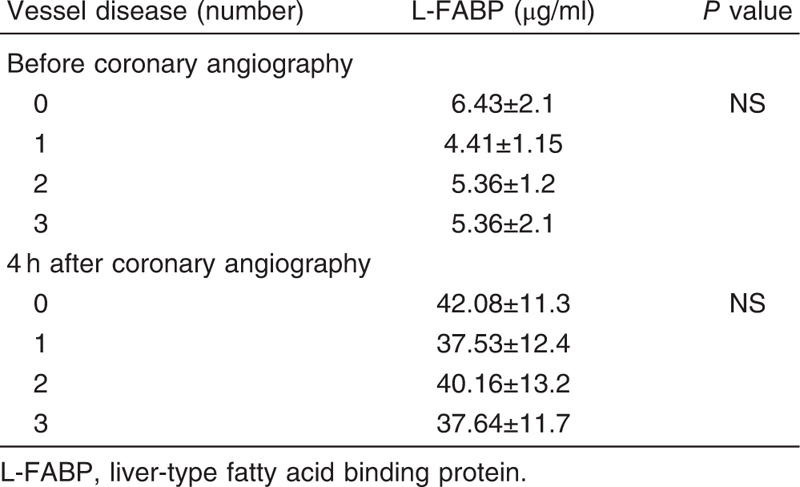 Clinical significance of the measurements of urinary liver-type fatty acid binding protein levels in patients with acute coronary syndrome. J Cardiol 2012; 60:168–173. Schnell D, Deruddre S, Harrois A, Pottecher J, Cosson C, Adoui N et al. Renal resistive index better predicts the occurrence of acute kidney injury than cystatin C. Shock 2012; 38:592–597. Marty P, Szatjnic S, Ferre F, Conil J-M, Mayeur N, Fourcade O et al. Doppler renal resistive index for early detection of acute kidney injury after major orthopedic surgery. Eur J Anaesthesiol 2015; 32:37–43.